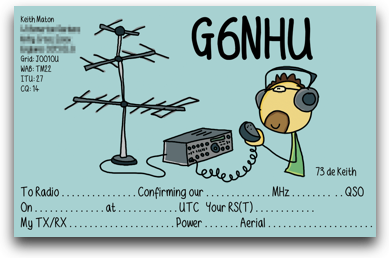 All stations mentioned in this blog will be sent a QSL card via the bureau unless their qrz.com page specifically states that they do not QSL. QSOs made during contests will not automatically be sent a card unless you’re a new DXCC or square. If you work me during a contest and want a card, simply send me one and I will happily reciprocate. All sent QSL cards will be endorsed by a sticker on the back showing which number day the QSO was made on. QSL cards will be sent out in monthly batches to the bureau. This means that at least some cards should arrive before the year is up. Any cards received direct will be replied to directly as long as you include either two IRCs or green stamps. If you wish to QSL direct, my address is correct in any RSGB callbook published since 1993.